Who said water and electronics don't mix? 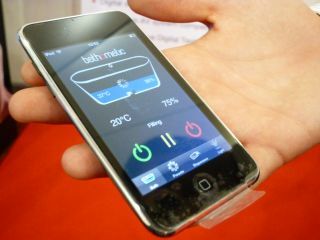 Unique Automation, a London-based company which focuses on making your home life that little bit easier and techier, has demoed its Bath-o-matic iPhone app at this year's CEDIA expo. The technology behind the app is not actually that new. Bath-o-matic has been catering to the lazier of us for around a year now, filling up baths around the country without you once having to touch cumbersome things like taps. But seeing it on the iPhone - or in the case of the demo we saw, an iPod touch - shows off just how integrated the phone is becoming as the remote control for everything in the home. The app itself is free, and will let you choose how deep you want your bath water and at what temperature. And for those that prefer their cleansing a bit quicker, there's also a shower version of the app. Unfortunately, to use the application, you will have to have Unique Automation's Bath-o-matic technology installed into your home. This is essentially an electronic box that sends out all the right signals and hardware that controls the draining, temperature and pressure of the water coming out of the taps. This job-lot of gadgetry will set you back around £4,000 for the basic system. Not so lazy now, eh?